Compliance with international recommendations such as Contla SIGTTO UNE-EN 1532 and UNE-EN 1472 standards. DAM is one of the most advanced berthing aid systems that uses laser beams to provide extremely accurate relative positioning information, minimizing the risk of an accident. Laser is, nowadays, the most accurate and reliable method available. The system is composed of several hardware measuring units and connected to a software that analyzes every single variable, in order to protect vessels and landing docks, with real-time and efficient measuring and warning alert system. Vessel position can be monitored as well as in a computer as in a large display placed on the dock, being accessible simultaneously to vessel’s crew and to the harbour’s operators. This allows to carry out berthing and unberthing operations in a safe, smooth and timely manner. Prosertek carries out the process entirely from design, integration and supply to installation and commissioning. DAM is the Berthing Aid System developed by Kareletik, a Prosertek´s subsidiary company. DAM stands for Docking Assisted Monitoring. The system collects information such as vessel speed, positioning, mooring stress, fender performance, meteorological conditions and oceanographical data, which is a warranty to achieve a controlled and safe berthing. Ship position and meteorological conditions are known in real time, alarms are managed by customer and data is available for post-berthing analysis. DAM-BM: monitoring of docking and undocking. DAM-MS: monitoring of mooring tensions. DAM-LD: loading arm drift report. Available standard type based on industrial communications systems. Flexibility for specific adaptations based on the standard. Prosertek’s berthing aid systems come with different add-on modules that fit every requirement. 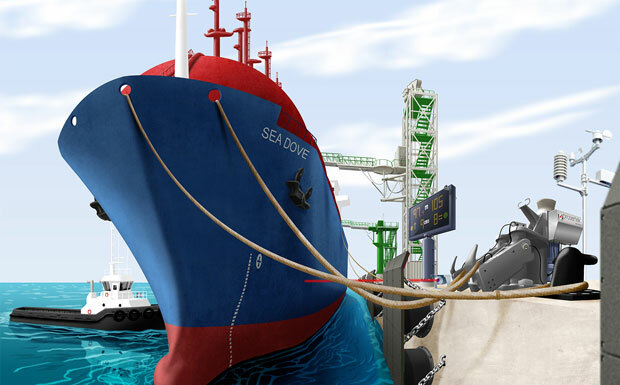 Our berthing aid systems strictly comply with all safety regulations, standards and directives in force. Prosertek has installed its systems in different national and international ports. Here are some of them.